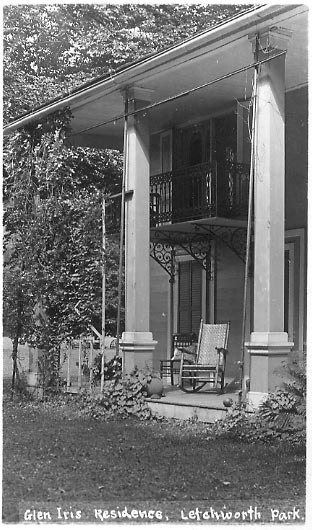 "Glen Iris Residence, Letchworth Park"
This peaceful scene shows part of porch of the Glen Iris, including a rocking chair. The cast iron balcony was part of the early renovations done by Mr Letchworth. It marks the location of the Cherry Suite. Although this postcard is neither dated or postmarked, there are certain clues that help us set an approximate date. When he gave the Estate to the Park in 1907, Mr. Letchworth retained life use of the Glen Iris as his home. The fact that "Letchworth Park" is used makes it later that 1907, and being called the "residence" hints that Mr. Letchworth may still live there. He died in 1910. For more information on the Glen Iris, see our Glimpse.